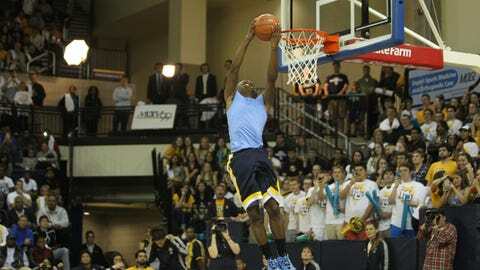 Freshman guard Duane Wilson dunks during the preseason Marquette Madness event. MILWAUKEE — Having not yet played this season due to a preseason leg injury, Marquette freshman guard Duane Wilson will redshirt the 2013-14 season. Wilson suffered a stress fracture in his left leg just prior to the start of the season and was cleared to return to practice on a limited basis Dec. 4. He was able to gradually increase his time on the playing court and even suited up for recent games but hasn’t played. The consensus top-100 recruit out of Whitefish Bay Dominican High School in Milwaukee will continue to rehab and strengthen his left leg while practicing with the Golden Eagles. At the time of Wilson’s return to practice, Marquette coach Buzz Williams acknowledged a redshirt was a possibility but wanted to have a discussion with the family before making any decisions. "After thorough conversations with Duane and his family, we have decided it’s best for his career that he redshirt this year," Williams said Friday. Wilson sit out the remainder of the season but will maintain four years of eligibility. The point guard had a chance to come in and earn playing time behind Derrick Wilson this season but was set back by the injury. While the Golden Eagles are not deep at point guard, it would be unfair to think a player who has yet to play a minute of college basketball could step in and provide a significant enough of a lift to consider burning a year of eligibility. Marquette went through a very similar situation with Junior Cadougan when he blew out his Achilles in the summer prior to his freshman season. Cadougan and his mother decided to burn the year of eligibility to play sparingly in 12 games. If Cadougan had redshirted, he would have been on a senior on this year’s team. "If you are his dad, or you are his mom, what’s the right thing for his life?" Williams said about Wilson on Dec. 5. "It’s not my life, it’s his life. It’s not only what’s best for his life, but his career. You just keep minimizing and then get to what’s best right now. "I think you need to have some wisdom to make those decisions. I don’t think you can make those decisions in a day. I don’t think he can practice 17 minutes and say, ‘Oh, he’d really help us.’ It’s not about the team at that time. It has to be about his life and his career."